Hello and welcome to the Focused on Story Blog by J.Q. Rose. Are you a word lover? You're here at the right place. All this month I'll be revealing words that fascinate me. Jeremiad is derived from Jeremiah, a Jewish prophet who is known for his lamentations on the hardships endured by a prophet with an unpopular message. He carried on and on about Hebrews and accusing them of false worship and injustice. He also complained about the king and his selfishness and materialism. In the Bible’s Old Testament in the book of Jeremiah, he lamented about the hardships endured by a prophet with an unpopular message. Poor Jeremiah. I bet you have heard jeremiads from friends and family on today’s hot topics. How do you respectfully handle someone who goes on and on and on? Please leave a comment below and help us all out with this problem. We kicked off a new guest author series, The Five W's in Story, in March. I've suspended this event during this April Challenge because I like to allow my guest 6 days of exposure on this blog to reach the largest audience possible. I value the time the guest takes to put together the blog post and their books, so I want to allow readers as much time as possible to meet the person and his/her work. So what are the 5 W's? One of the basics when learning to be a writer is to listen to a lecture on the Five W's and the H. The 5 W's, who, what, where, when. and why are the essence of a story. 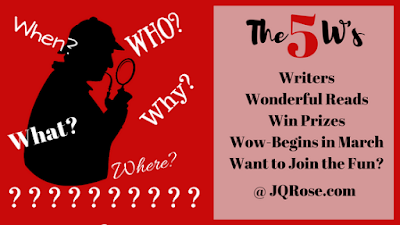 Since we are focused on story at this blog, we need to realize just how important working out the 5 W's can be in creating a great story for readers. You'll find this series with my guests informative and entertaining and not a stuffy lecture in a dusty, old classroom with a professor palavering on and on and on. No jeremiads here! Click here to visit the first in the series by historical romance author Rosemary Morris. Her blog post is an overview of the 5 W's in her romance stories. Then enjoy reading all of the guests' blog posts every Wednesday in March. Return in May to meet more authors and discover their books and the 5 W's in their stories. If you are a traditional or self-published author of mysteries, romance, and/or suspense, please contact me to be a guest this summer. Email me at jqrose0 at gmail dot com. Thank you! I had not heard that before and such an interesting etymology too. unfortunately, Jeremiads often end up losing friends and being avoided. I tend to respond to them that way. It's one thing for someone to go through a rough patch, but some people have constant drama they dredge up to keep the cycle going. 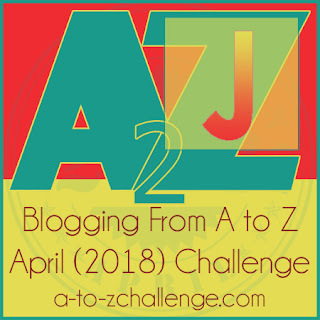 Hi Juneta, I'm finding one of the perks of doing the A to Z Challenge is learning new things. I'm having a ball doing research on these words. Hi Heather, yes "constant drama" are the key words here. Some folks thrive on the drama. Thanks for stopping in. I know a Jeremy that fits that description exactly. I never realized that his name literally has etymology roots in that kind of personality! The great thing about this Jeremy is that even though he does tend to feel put upon, he also has a real gift for helping people laugh in almost any situation. Hi Jen, I never put Jeremy together with Jeremiah. Interesting connection to his personality! Blogging from A-Z Challenge: Those Darn Cats!